The exciting Whale product range, which is being presented at this week’s IFAT exhibition in Mumbai India, brings a new level of reliability, service and value to the waste and cleaning industry in India. 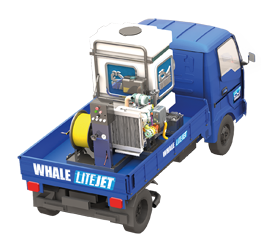 The WhaleLiteJet is a jetting unit designed to either fit into a small LCV such as the Tata, Piaggio or Mahindra, all of which are ideally suited for narrow roads and confined spaces where a tight turning radius is required. Additionally they may also be used as a standalone static or trolley unit dependant on customer requirements. The powerful triplex jetting pump has been incorporated into the overall design, so its performance is suitable for a range of cleaning processes. A powerful triplex jetting pump makes the LiteJet suitable for a wide range of cleaning processes. Its modular design makes it highly adaptable and, thanks to the innovative design of both the units’ tubular structure frame and HDPE water tank, it has excellent water capacity allowing highly effective jetting over a long period of time. The controls have been ergonomically designed to ensure operator comfort whilst also having a number of safety features included. The unit comes equipped with an extensive range of standard equipment, with a wide choice of unique options and accessories are also available. All these benefits ensure this is an ideal jetting unit suitable for a cross section of cleaning activities and it is competitively priced. A great deal of attention has been paid to both the functionality and design of the new WhaleLiteJet ensuring the unit is attractive for both starting and professional sewer-jetting specialists. The CombiWhale is a powerful, multi functional drain cleaning and jetting vehicle, currently available in four key levels of specification. The Entry Level Combination is already proving to be an excellent solution for cleaning and removing blockages in sewage pipes. It is ideally suited to working in narrow streets and comes equipped with high pressure water jetting to clear private drains. The vacuum tank can be used to empty septic tanks. With all the features and benefits of its entry-level specification stablemate, the Budget Combination is mounted on a 16 tonne chassis and gives specifiers a 3,000 litre operating capacity and high pressure water jetting capabilities. The High and Premium Combination versions of the CombiWhale are designed for larger diameter sewer jetting. Incorporating all the features of both the Entry-Level and Budget models, the jetting performance is taken to the next level, providing an appliance capable of taking on a wider range of functions typically required by municipality and private customers alike. Equipped with improved flow and pressure from the larger jetting pump, there is little that these two models cannot handle. Both have tipping as standard and a wide range of upgrades available for improving both efficiency and health and safety. 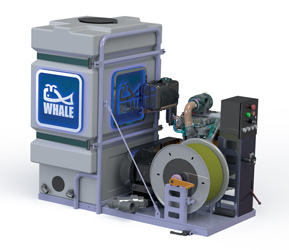 The third product family in the Whale range is the KaiserWhale, already recognised throughout the UK as a market leading, highly specialised sewer cleaning solution with continuous dirty water recycling. Developed in technical partnership with Kaiser AG – the acknowledged European leader in water recycling equipment – the KaiserWhale offers significant operational benefits when it comes to specialist sewer cleaning operations. Through the effective reuse of dirty water for jetting, the KaiserWhale maximises the time spent working on the job, whilst minimising the time taken in tapping into precious clean water supplies. Designed and built to meet the specific needs of particular municipalities across India, it is an effective, powerful jetter and sewer cleaner that is available on 16, 25 and 31 tonne vehicles, with demountable variants also available. The Whale product range is manufactured by Whale Enterprise PVT located in the state of Tamilnadu, India. The company is supported by Whale Tankers in the UK, providing access to a wealth of engineering and technical resources and experience. Quality characterises both companies, with particular importance on customer focus and operating a fully ISO 9001 compliant quality system. The success of Whale in Europe over five decades has been founded on excellent parts availability and service support and this is an integral part of its Indian operations. Whale Enterprise are official dealers for a wide range of parts from European companies such as Kaiser, Moro, NouvaConTec, Pratissoli, Omsi, Molex, Mistral, Eurovac, Hibon and Samson. An extensive parts range includes pumps, valves and nozzles – all of which can be transported quickly to ensure unscheduled downtime is kept to an absolute minimum. Whale Enterprise is also a manufacturer of a range of customised tanker parts. Equally important is the Whale Enterprise service operation, a dedicated team of highly trained service professionals – backed by the expertise of the Whale engineering department – who have an extensive knowledge and understanding of both Vacuum/Pressure tankers and Jetting equipment. Wherever possible, warranty and preventative maintenance work is carried out at the customers own premises, to ensure that they are able to give the highest level of service. Speaking at the show, Whale Enterprise Director Mr. Shajahan Hussain said “Whale Enterprise builds a comprehensive range of tankers to suit a variety of vacuum tanker and jetting needs, specifically designed for Indian applications. Long term value for the customer is at the heart of everything we do and our aim is to continually improve the quality and value of our products, through design innovation, to maximise durability, reliability, ease of maintenance, fitness for purpose and residual value”.